No one could have known that when a Tunisian fruit vendor set himself on fire in a public square, it would incite protests that would topple dictators and start a global wave of dissent. 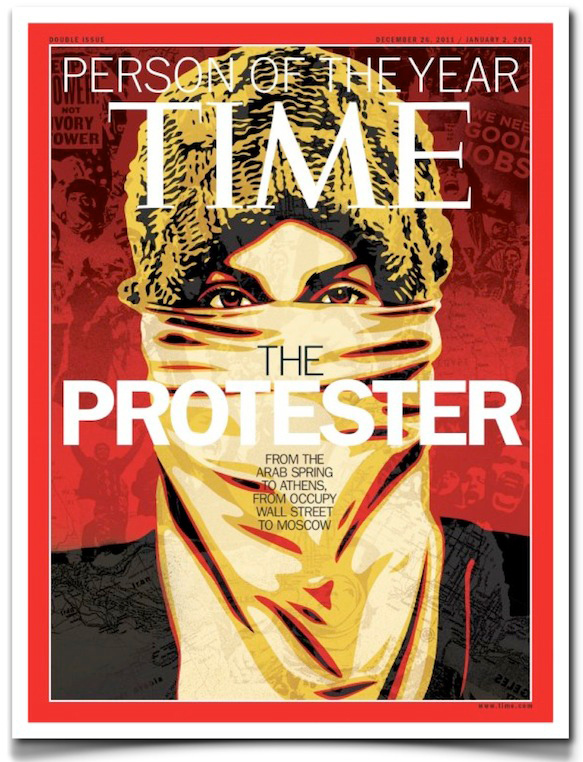 In 2011, protesters didn’t just voice their complaints; they changed the world. For “once again becoming a maker of history” two sleepy decades after political soothsayer Francis Fukuyama declared Western liberalism the end point in the evolution of human society, Time magazine named “The Protester” 2011’s Person of the Year. Nathan Schneider, author and editor with a number of publishing outfits—including ‘Waging Nonviolence,’ a blog devoted to analysis of nonviolent movements around the world—was pleased with Time’s decision. He pointed out, however, that the mainstream American press was slow to get to the uprisings at home and beyond: “As I first saw this announcement percolating on Twitter, being spread around proudly every which way by Occupy Wall Street-allied accounts, all I could think was: What took you so long? Where were you?” he asked. today we are thinking of the same thing. This was a good choice for Time. About Time!! Glad you posted this Carraol, was interested to see how they would portray 'the protester'.